A hernia is a protrusion in the abdominal wall. In this condition the abdominal wall ruptures and a portion of your abdominal contents, usually your intestines, protrudes through the opening. 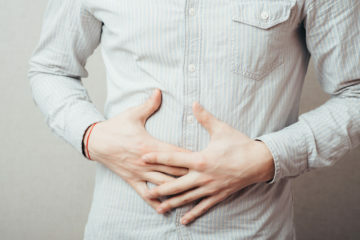 The most common region for a hernia to develop is in your belly button, also known as an umbilical hernia, or in the region of the groin, known as an inguinal hernia. Many of our patients can self-diagnose their hernias. In many instances, they feel a pain in their abdomen followed by the presence of a bulge after performing strenuous activities. This bulge that is now felt was not there before. Not all hernias are painful, so the presence of a bulge may be the only sign of the condition. Often the bulge appears while standing and disappears when lying down. If you press on the bulge, you may feel a squishy sensation as if it the bulge is filled with air. When this occurs, the hernia is more likely to contain intestines. Hernias that contain your intestines are more likely to result in incarceration or strangulation. This is a surgical emergency and requires immediate attention. It is better to be safe than sorry and have any abnormal bulge on your abdomen checked out by your physician. Due to their extensive training and focused approach, we believe hernia specialists are best suited for hernia repair surgery. At our practice, our board certified general surgeons have performed tens of thousands of hernia surgeries over the last two and half decades.